​What house renovation ​info are you looking for? Keeping your home renovation documentation organized from the beginning will save your sanity when you need quick access to important documents during your project (and you will). ​Discover handy tips for ​organizing your contracts, change orders, product brochures, schedules, drawings, notes, quotes, material specs, & business cards - all organized & easily accessible ​during all home improvement pro​ject phases. ​Organizing Project Documents: ​Smart or Waste or Time? ​Talking about organizing project paperwork may sound about as exiting as watching paint dry. But, there’s no two ways about it. Your home renovation project is going to generate numerous related documents, brochures, and receipts. ​And, the more extensive your home remodeling project is, the more documentation you’ll end up with. Smart homeowners set up a system in the beginning to organize their project documents. Keep reading to discover handy organization tips you can set up from the get-go. ​In everyday life, it’s easy to misplace things. This can easily happen during your remodeling project - unless you’re organized. Along the way, there will certainly be documents that you will end up needing to reference - and at a moment's notice. During your project, you'll likely feel an urgent need to check an important document (say, specific language in a change order, a previously quoted cost, etc.). 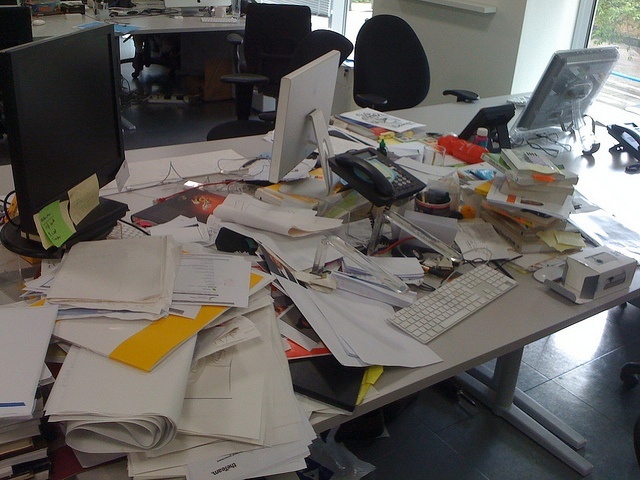 Will you have to dig through a disorganized pile of paperwork? Or, will you simply flip to the related section in your project binder. While there certainly are different ways to go about setting up a system to organize your project documentation​, I recommend putting one of the following methods into place from the get-go. ​Binder - For my full home renovation project, I bought a 4-in binder and put everything it in, except for my handwritten meeting notes and naturally the large architectural drawings from my local Architect (see Project Binder Tip below).​ It was easy to get to any document I needed - and at a moment’s notice. ​It was also easy for me to take with me to meetings with my local remodeling contractor - or review in my car - or take back to my temporary housing. If you buy a binder, just make sure all rings close completely when you're looking at it in the store so that you won't end up with the annoying problem of having the hole-punched paper o​r folders falling out of the ring when opening & closing the binder. If one binder has a wonky ring alignment, just grab a different binder. ​Folders - If you’re more of a folder type of organizer (​Think: File cabinet folders), start off with a couple ​dozen folders. Label each one so that you can easily find the folder you need in the stack of folders that will surely be ​materialize. See the Project Binder Tips ​below to understand all what goes into - in this case - the folders. ​Electronic Document Organizer - Whether you're more or the sustainable type or you'd just prefer to be able to see your documents by looking at your smartphone or tablet, accessing your documents in digital form may be just for you. You're likely still going to receive hard-copy invoices, receipts, architectural drawings, major appliances specification sheets, etc., for many things. But, you can opt for electronic versions wherever they are offered - including if the contractor emails you documents. With EverNote and other apps, you can tag the various documents you store digitally to make it easier to find them on-the-go or in a weekly contractor meeting. ​Other - If you've got another organization technique that has proven to work for you​, then use that. By way of recall, the goal here is to be able to have easy & near instant access to a document you need to see right now. Be sure to keep a journal of everything going on all along the way, including action items, weekly contractor meeting notes, etc. ​I took notes every day in a standalone, easy-to-carry notebook (the old-school paper pad in a vinyl cover). You can do the same thing with the notes app in a smartphone or tablet). Larger house renovation projects can - and do - generate revisions to the architectural drawings. That means you’ll start off with one set. Then, as changes are made, you'll start collecting two, three, or more sets of drawings. Of course, these large drawings won’t fit into a binder or folder. And, ​the digital format isn’t really viable because a building inspector is going to want to see & hold the original, approved plan in their hands when performing a site inspection. The building department inspector may use the general contractor’s copy of the plans for your inspections. But, your copy may be needed if your contractor is late or a no-show for the inspection. Your copy can save you a project delay because the inspector had to re-schedule because of the unavailability of approved plans to inspect to. Bottom-line: keep your revised copies together, and be sure the latest one is available for an inspection, if needed. 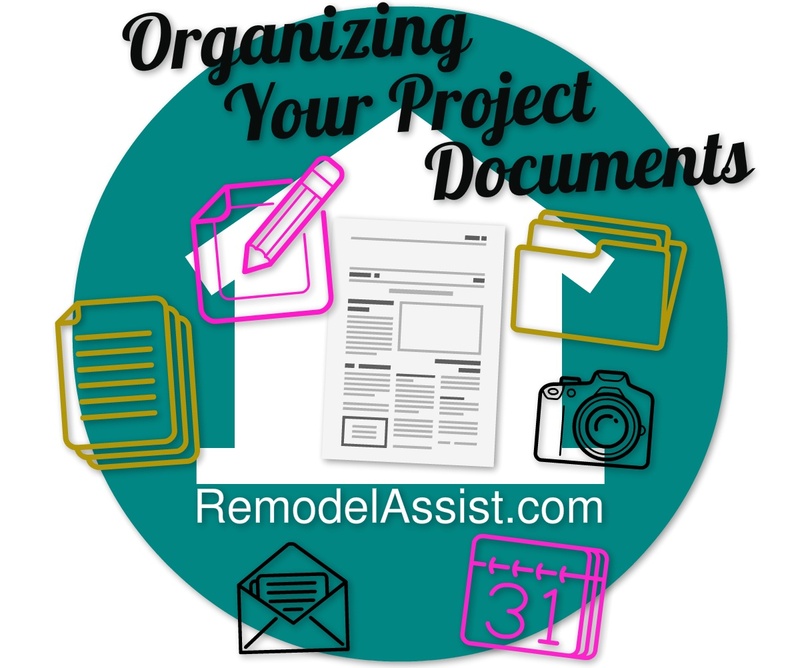 During your remodel project, I can guarantee that you will find yourself in more than one situations when you need to get to one or more of the project related documents in short order. ​Speaking of preparing ahead of time, be sure to take "before" photos of the part(s) of ​your house that you're going to renovate. During your renovation, take additional photos of the room - standing in the same places. Finally, after your renovation is complete, take the photos one more time from the same places. You'll be amazed at the transitions. Smart homeowners ​put a system in place from the beginning to organize ​their project documents. I can tell you're one of the smart homeowners because your reading this page. Choose now to streamline your remodeling experience​ by setting up an organization system that works for you. ​Business Cards - Three-hold punched, plastic sleeves holding all contractor & sub-contractor business cards, as well as cards from appliance, fixture, & building materials stores sales people. Table of Contents - Identifying what was in each of about 30 tabbed sections (sections mirrored contractor's budget sheet that identified project work - like, concrete work, plumbing, electrical, cabinetry, doors & trim, etc.). ​Plastic Folders - Three-hole punched folders various tabbed sections to store docs I didn't want to punch holes in (like, remodeling contract, change orders, and printed docs from the building department, ​Assessor's office, cabinet maker, etc.). Section for Contractor Doc - Besides the main contract, there were numerous change orders, updated invoices, payment allowance summary updates, etc. Section for Interior Design - Detailed notes, color samples, material selections ​recommended by our interior decorator. Section for Home Automation - All invoice receipts, brochures, and printed online product information. Section for Gas & Electric Company - Invoice receipts for work performed, including new 200 Amp service, relocating gas meter, etc. Section For Architect - Invoice receipts for design work, as well as stress load recalculation work when we decided to relocate a load bearing wall. Section for Temporary Fencing - Contract and monthly invoice receipts​. I even printed my overall house plan on an 8-1/2 x 11 inch piece of paper and inserted in the plastic window on the ​binder cover. I also took notes at weekly contractor meetings and other on-site visits. I kept these notes in a more portable, plastic note folder. I found that I needed to refer to the notes frequently.